If you or your institution subscribes to ProjectMuse, then you can click on the link to the article (in this sentence or in the first one) and go straight there. Or you may need to log in through your institution’s library first. If you or your institution lack a subscription, then the article will be inaccessible (unless you pay for it). This is a problem. It’s one reason why I’ve taken to sharing some work in progress on this blog. After all, scholars don’t get paid for writing scholarly articles. Indeed, this Obama article cost me hundreds of dollars in permissions fees (for the images) — fees paid out of my own pocket. Of course, I’m not in this for the money. I’m in it because I like learning and then sharing what I’ve learned. I was intrigued by the proliferation of children’s books about Obama, and so I thought: How many are there? What do these books tell us? The answer to the first question is 59 by the end of his first year in office (12 of those were published prior to the election). The full answer to the second question is… in the article. For a partial and incomplete answer to the second question, you might read some news articles I was quoted in, such as this December 2009 Washington Post piece (after I gave the talk at the American Studies Association) or this March 2010 piece in the K-State Collegian (after I gave a longer version here at Kansas State University). But, yeah, to get it all — including access to all those images I paid for — you need to read the Children’s Literature Association Quarterly article. The answer to the larger question of how to make scholarship more widely available is something smarter people are working on. If you’re interested in seeking answers to the larger question, then I invite you to peruse the work of Kathleen Fitzpatrick or visit MediaCommons, which is also trying to solve the problem. Regarding scholarly work… I started blogging a few years ago in an effort to get my work into the hands of teachers (pre-school thru university profs), librarians and parents. Expense (as you noted), but also lack of time and just plain knowing about this work are all barriers to effecting change in what books get bought, read, set aside, etc. A great many writers, editors, and reviewers also read my site. I’ll look at your article. In my study of OF THEE I SING thus far (and in comments), I think it is fair to say that Obama’s treatment of the 13 individuals in OF THEE I SING might be similar to what you found in bios of him. Case in point: George Washington chopping down that cherry tree! Never happened! Yet its told as fact and I suspect that a good many bios for children include it. In fact, Obama’s text on Washington doesn’t mention it, but Loren Long (the illustrator for OF THEE I SING) shows the child-Washington holding a hatchet! Terry: I did miss that one. The article only covers books through January 2010. I limited myself to books published up through the first year of his presidency. 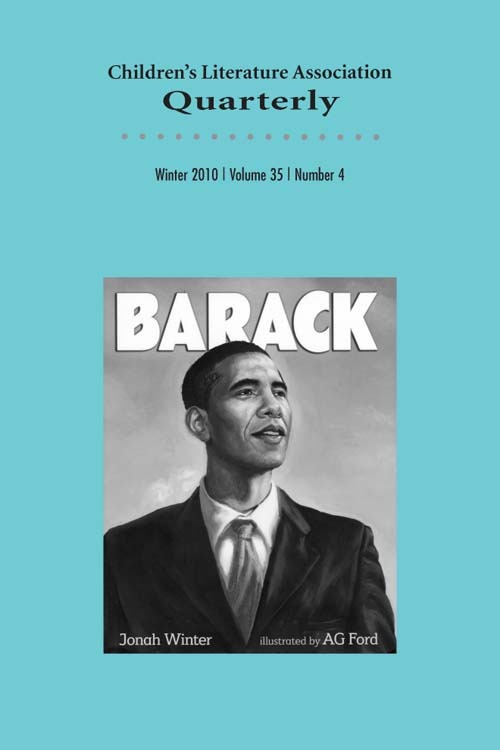 The only anti-Obama book published within that period was Help! Mom! Radicals Are Ruining My Country! Debbie: As context, I do make note of both George Washington (Mason Weems, in particular, since he’s the source of the cherry tree myth) and Abraham Lincoln. Thanks for the link to your post on Obama’s children’s book — since it was only just published, it missed my survey. Do you know that you can negotiate with journal publishers to maintain the right to put up an open access copy of your articles? I’ve done it many times. The SPARC author addendum is an excellent instrument and a good starting point, and most journals are familiar with the requests (though they’ll try to talk you out of it). Thanks for the advice, Deborah. No, I did not know about the SPARC author addendum. Will check it out.